Hoofddorp, the Netherlands, August 29, 2017 – Compact needn’t mean compromise is the promise delivered on by the new Vivitek D4000 Series. With its condensed compact footprint and light 10kg weight, this laser projector is appropriately-sized for companies with medium sized corporate meeting rooms that want the performance of a powerful laser projector, but without the size and weight traditionally associated with them. To meet their requirements, the D4000 Series – which comprises the DU4671Z, the DH4661Z and the DW4650Z – offers the choice of WUXGA, 1080p and WXGA resolutions while delivering a brightness level of up to 5,500 lumens. With its laser light source, the D4000 Series delivers up to 20,000 hours of operation time with minimum maintenance, thus providing users with peace of mind. Underpinning its inherent robustness, is an anti-dust sealed optical engine. This not only optimises light efficiency, but it has been designed to prevent dust and moisture from affecting the lighting and thermal system. This ensures customers have peace of mind knowing that image quality and a long lifespan are assured. The D4000 Series also benefits from Vivitek’s expertise in thermal management. As a result, the projector offers improved cooling efficiency and effectiveness, which brings two major benefits to users and to the longevity of the projector. First, the advanced cooling means the projector can operate with a slower fan speed, which results in it being far quieter and less obtrusive than other projectors. Second, the improved cooling protects the projector from high temperatures, extending its operating life. 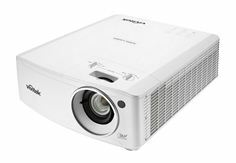 With ease of installation ease in mind, the projectors are equipped with a 1.65x zoom fixed lens with Vertical and Horizontal lens shift, which also brings a new level of cost effectiveness to the D4000 Series. This makes its performance and image quality accessible to more potential customers. The lens shift capacity ensures placement flexibility, while the HDBaseT interface delivers long signal transmissions. To kick-start meetings rapidly and limit productivity-compromising downtime, the models’ compatibility with Vivitek’s NovoConnect Solution allows for distributed display and control between PC, Mac and tablet devices for a completely interactive presentation and collaboration environment. The fully wireless communication enables content sharing across multiple devices and is compatible with Windows, Mac OS, iOS and Android operating systems. For environments outside of the corporate business world, the D4000 Series also features DICOM* Simulation Mode, which makes it ideal for viewing grayscale medical images – such as X-rays – for medical training and medical seminar purposes. *Note: These projectors are not medical devices, and the “DICOM Simulation Mode” cannot be used for actual medical diagnosis purposes. The D4000 Series will be available now with a five-year large venue laser phosphor warranty. Delta, founded in 1971, is a global leader in power and thermal management solutions and a major player in several product segments such as industrial automation, displays, and networking. Its mission statement, “To provide innovative, clean and energy-efficient solutions for a better tomorrow,” focuses on addressing key environmental issues such as global climate change. As an energy-saving solutions provider with core competencies in power electronics and innovative research and development, Delta’s business domains include Power Electronics, Energy Management, and Smart Green Life. Delta has 163 sales offices, 64 R&D centers and 39 manufacturing facilities worldwide. *All brands, marks, or product names mentioned herein are trademarks of their respective companies and are referred only for explanation or descriptive purpose and to the owners’ benefit, without intention of use or infringement.